Tour America’s Most Haunted Hotel where some guests checked out…but never left. The Crescent has been featured on popular shows like Ghost Hunter’s and Bio Channel’s My Ghost Story. Tours gain exclusive access to some of the most famous ghost sighting locations. The show you just gotta see! Celebrating 40 years of music and fun. Arkansas’ first and longest running nightly show. The Pine Mountain Theater features some of the Ozarks finest entertainers presenting top 40 and classic country music, classic rock n roll, rhythm & blues, gospel and patriotic music. There’s also lots of family comedy. Children under 12 are admitted FREE and there’s always FREE Popcorn. Make a family memory with a Natural State tradition. For an evening of Mystery and Intrigue with Sean-Paul the Illusionist and Juliana Fay as the Medium the show features Special Guests from the other side. Take a Seat – but your family will only use the edge of it. This Nationally acclaimed team take their audience to the Golden Age of Magic and give demonstrations of mysteries that bring the crowd to the edge of their seats! SAVE $1 by buying in advance. Have a roaring good time at Turpentine Creek Wildlife Refuge. Spend the day with large cats (lions, tigers, etc.) and other exotic animals. Come face to face with a tiger! Day pass gives you access all day. Visit during feeding time (4pm during winter & 5pm during summer) recommended. Take a brave step into Eureka Springs unexplained underground. Discover buildings that lie under the streets and see the city in a way that even local residents haven’t seen! 75 minutes. See the “Largest Attended Outdoor Drama in America,” and watch “The Greatest Story Ever Told” come to life like never before! 1 hour 45 minutes. Get Tickets Online! While you are there, visit the Bible Museum which displays over 6,000 bibles in more than 325 languages, many of them 1st editions as well as a page fro the Gutenberg Bible and a King James Version from 1611. Visit the Sacred Arts Gallery and see an amazing collection of biblically inspired art. Meet the “Stars” of Eureka Springs history. Hear Ripley’s Believe it or Not stories, stand in the spot that Carry Nation gave her last speech, see where one of the Doolin-Dalton Gang was caught by US Marshalls and more. 45 minutes. Explore the hallways of the seven story 1905 Basin Park Hotel. See where the illegal gambling parlors were in the 40’s and 50’s and hear stories of the lion ghost, the young woman who tries to evict tenants from “her” room or the cowboy who still roams silently through the rooms and halls of the hotel, perhaps looking for one last drink to wash away the trail dust. Ranked by Tripadvisor.com as one of the top activities to do in Eureka Springs. Tours depart at 1 and 3 PM on weekends in April and 7 days a week May through October. Start your visit by going back to the beginnings! Take the historic district tram tour! 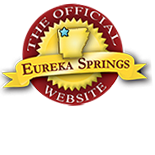 Find the biggest list of Eureka Springs Lodging on EurekaSprings.com. See last minute deals and specials on overnight accommodations and vacation packages on ReserveEureka.com. This entry was posted on June 21, 2014 by estcblog in Attractions, Basin Park Hotel, Crescent Hotel, Things to Do and tagged America's Most Haunted Hotel, Eureka Springs, Eureka Springs Arkansas, historic downtown, Turpentine Creek Wildlife Refuge.